In The Dark Volume by G.W, Dahlquist, we are re-united with Cardinal Chang, Doctor Svenson, Celeste Temple, Eloise DuJong and the Contessa di Lacquer-Sforza as they continue their adventures begun in The Glass Books of the Dream Eaters. I don’t really want to give the plot away as I do hope you will read the first volume in this series, but we join the characters as they outwit assassins, search for their lost companions and try and unravel the truth behind the mysterious and deadly books made of blue glass. Who is behind it all? And can they escape the secret plot that strikes at the core of the Government? Hmm… I so wanted to like this book. I really did. But I struggled to read it, although it did improve towards the end. Unlike its prequel, The Glass Books of the Dream Eaters which was fast, exciting and deliciously wicked, I felt the plot was indulgent, circling the central event, the points of views ricocheting from one character back to the next without advancing the plot significantly. 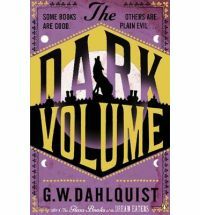 Don’t get me wrong, I love the world and the characters Dahlquist has created set in an alternate historic Europe with steam-punk overtones. And I mean how can you not love a novel with such fantastic character names as Francis Xonck and Charlotte Trapping as well as those already mentioned above? And that’s one of the reasons I didn’t give up on the book. But finishing it left me more frustrated than when I began. There’s going to be another book, but I’m not sure I can handle another one where the plot crawls at a snail’s pace with no closure in sight. Negative reviews aren’t my thing, but I just wanted to scream when I read this book because it could have been so much tighter. Dahlquist’s prose is smooth and excellent, but a bit more editing wouldn’t have hurt. Maybe I needed to read it in fewer sittings, but still, it just took me ages to finish and left me wanting… I’m not sure what. The only good thing about this book was Cardinal Chang. So repressed, so tortured, so hot. If you’ve read this book, what did you think? Am I being too harsh and did I miss the point? Was I focusing on Cardinal Chang too much??? Cardinal Chang. Mmmmm! I agree with you that the second book dragged on and on. I loved the first one, but the second was rather a disappointment. I’m so with you on the Cardinal Chang thing. Even though I know he’s supposed to be European, I still think of him as Chinese just because of the name. I just assumed Dahlquist will be writing another book just because of the way the story ended… He can’t just let it end like that, can he?? The thing is that I didn’t really love the first book. So I’m guessing that this is one I should skip. Good to know! Oh, you should definitely skip this one as it carries on from the first. Strictly for those who loved the first book or besotted with Cardinal Chang. I’m sorry to hear this was disappointing I haven’t read either this or the first book, but I know the feeling of being let down by the sequel to a book you loved.